Rob Hamilton | Morrow County Sentinel Graham Rahal is pictured running in the Honda Indy 200 in 2014. He would finish fifth in the race, which was held at Mid-Ohio Sports Car Course. In the midst of his best season to date as an IndyCar driver, Graham Rahal is looking forward to the series’ upcoming race at Mid-Ohio Sports Car Course. The 26-year-old Ohio native was back in the Buckeye state for a couple days in late June to promote the event, which takes place from July 31 to Aug. 2. Being able to spend some time in his home state was fun for the driver, who got to meet various Ohio State football players during his visit. 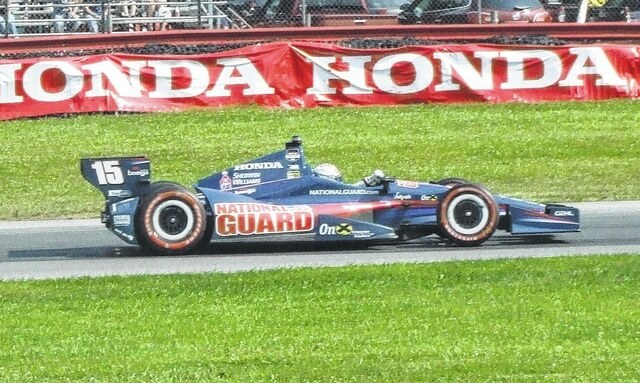 In the 2015 IndyCar season, Rahal was fifth in the points race after the first nine events for the Rahal Letterman Lanigan Racing team with five top-10 finishes. In the past two seasons for that team, he finished 18th and 19th. Rahal is hoping that improvement continues at Mid-Ohio. He placed fifth there last year for his best finish at the Morrow County race track since IndyCar returned there in 2010. Rahal noted that Mid-Ohio can be a strategic course to run. That track position becomes especially essential at a winding road course like Mid-Ohio where good passing lanes aren’t particularly common. For Rahal, the son of famed racer Bobby Rahal, competing in IndyCar is more a dream come true than work, though. Rahal has had some big highlights in his career, including being part of the winning car in the 2011 Rolex 24 at Daytona, as well as his first IndyCar win as a 19-year old at St. Petersburg in 2008. However, the opportunity to win at Indy is a big goal for him. His best finish in the Indianapolis 500 was third in 2011. For now, though, he is focusing on the upcoming races this summer, including the Mid-Ohio event, where he is expecting a tough race.